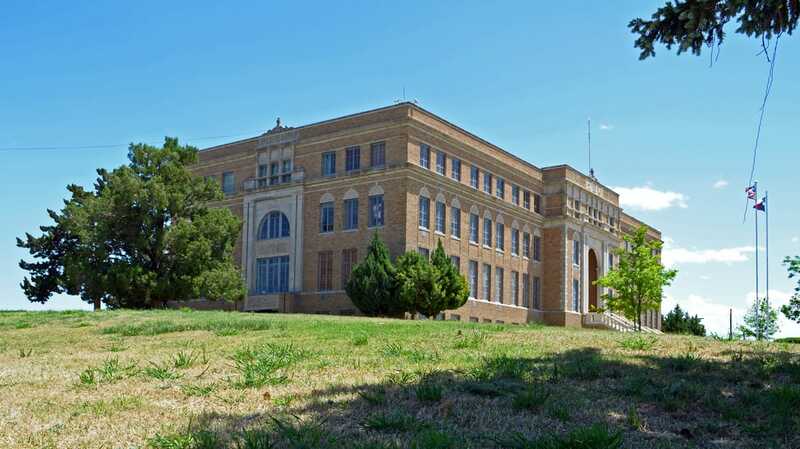 "Hutchinson County, in the north central section of the Panhandle, is bounded on the north by Hansford County, on the east by Roberts County, on the south by Carson County, and on the West by Moore County. It comprises 871 square miles of plains and broken terrain; altitudes range from 2,750 to 3,400 feet above sea level. The Canadian River, fed by several small creeks, angles across the county from southwest to northeast; in the southwest it is dammed to form Lake Meredith. Broken land along the river and its tributaries forms fertile valleys. The northern part of the county is high rolling plain. 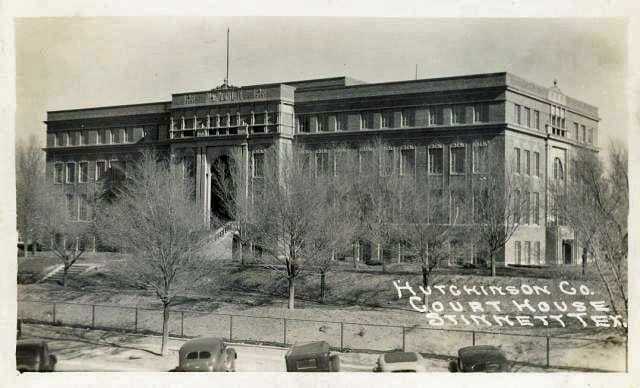 "In 1876 Hutchinson County was established. The county was named for pioneer jurist Anderson Hutchinson. 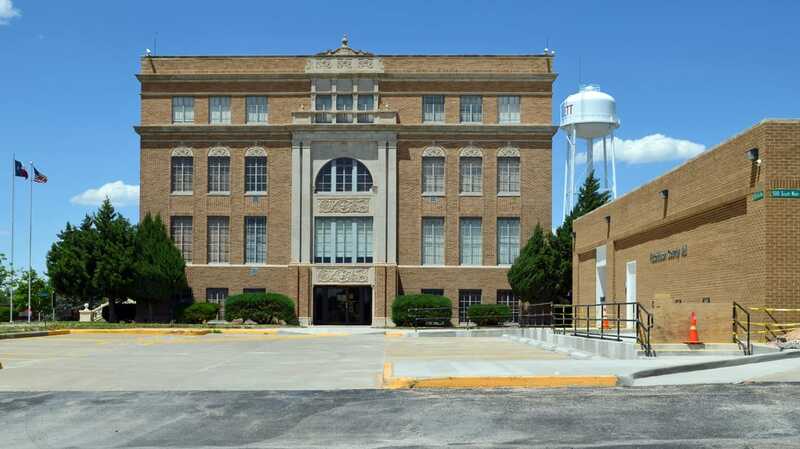 After its boundaries were established, Hutchinson County was attached for administrative purposes to Wheeler County and then to Carson County. In the spring of 1901 a movement was begun for its organization. Elections were held on April 25, and on May 13 the county was officially organized with the riverside town of Plemons as its seat of government. 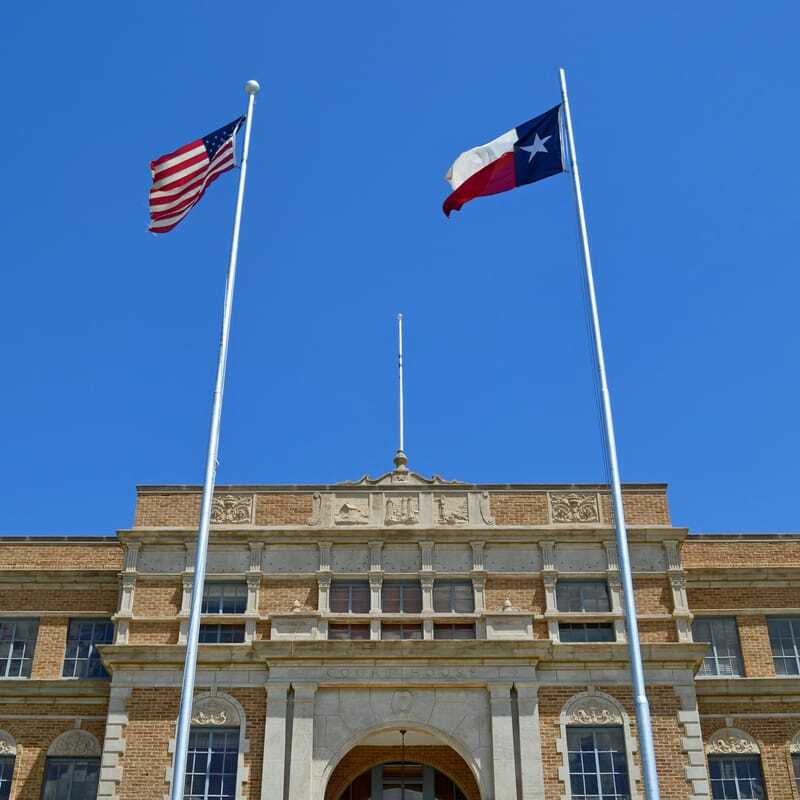 After a special election on September 18, 1926, Stinnett took over as county seat, thus causing the demise of Plemons. 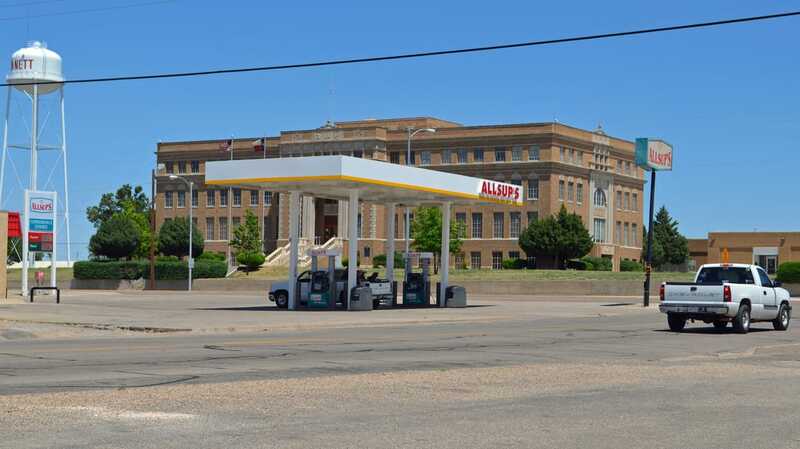 "Since the 1920's petroleum has been the chief industry; the southern part of Hutchinson County is the center of oil, gas, petrochemical, and synthetic-rubber production in the Panhandle. In the county is one of the world's largest pump stations for natural gas, which supplies metropolitan areas west to Denver and east to Indianapolis. " 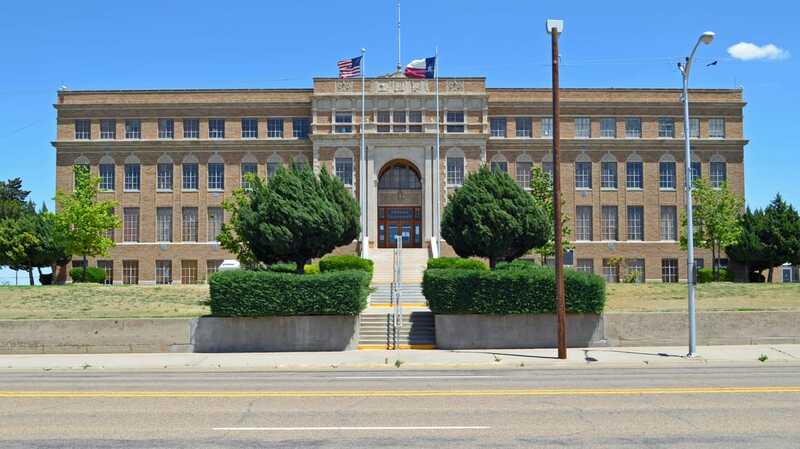 Handbook of Texas Online, H. Allen Anderson, "Hutchinson County"
I visited Hutchinson County and photographed the courthouse in Stinnett on May 8, 2016. 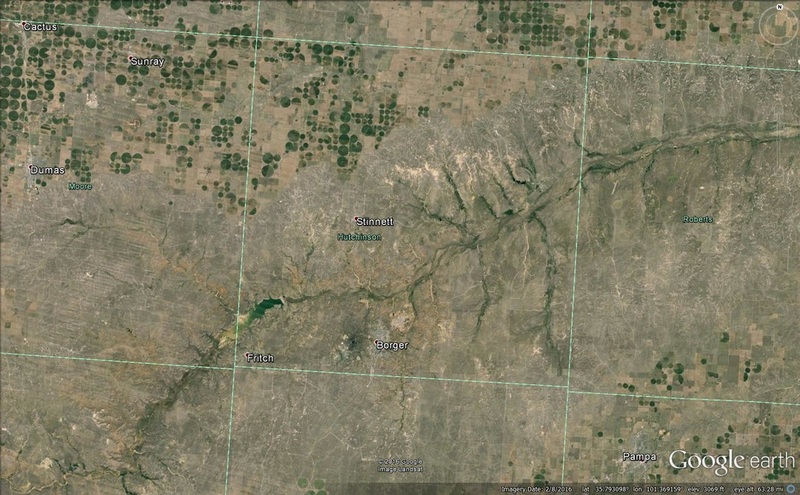 The Canadian River crosses Hutchinson County from southwest to northeast. 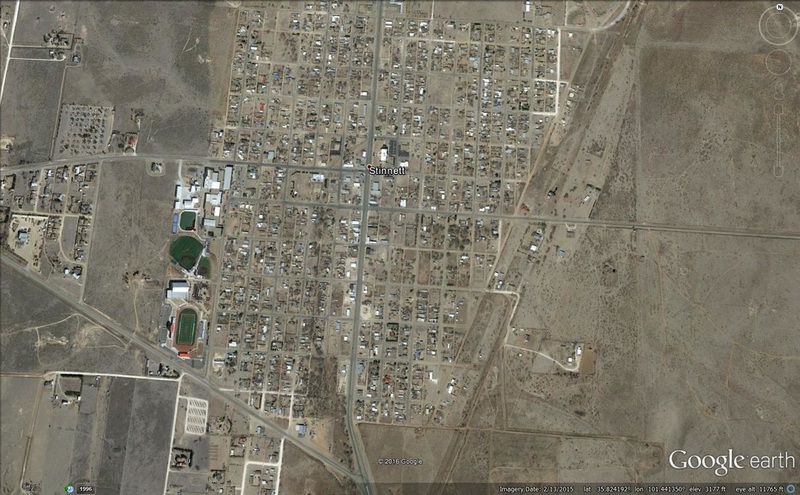 Stinnett, Texas: population 1,936. The majority of people in Hutchinson County live in Borger, on the southern edge of the county. 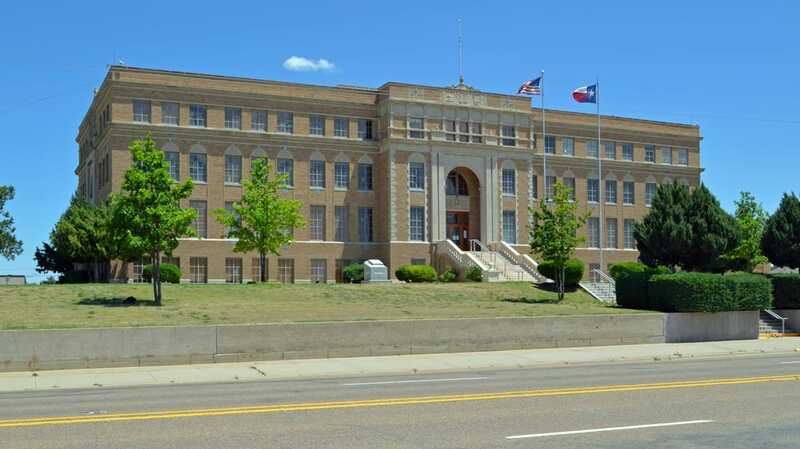 The courthouse occupies the center of a city block, fronting on Main Street, Texas 136. The courthouse faces west. The county jail is on the southeast corner of the square. 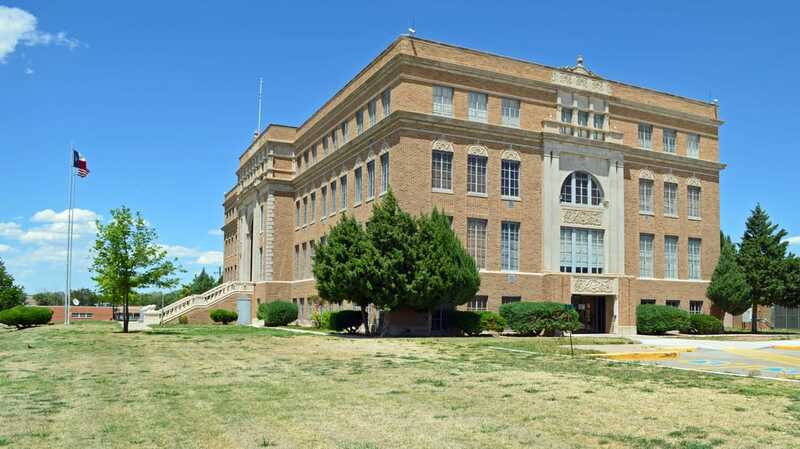 Architect William C. Townes, of Amarillo, designed this large courthouse. The courthouse is elevated above Main Street. This view is from the southwest. The front facade of the courthouse, reached via stairs from Main Street. 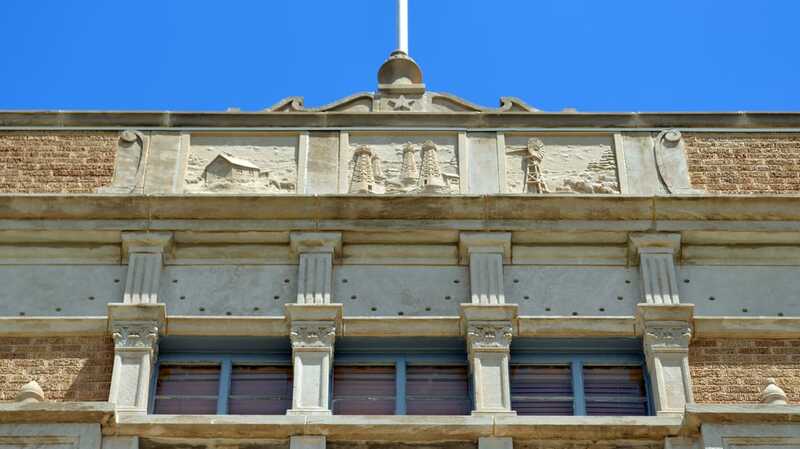 Blais relief sculptures above the main entrance depict the mainstays of Hutchinson County: farming, oil, and ranching. 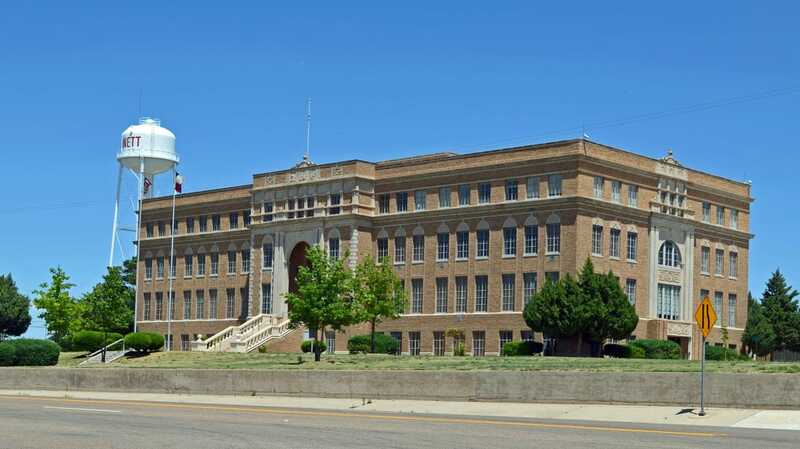 It was oil that made possible this massive courthouse. 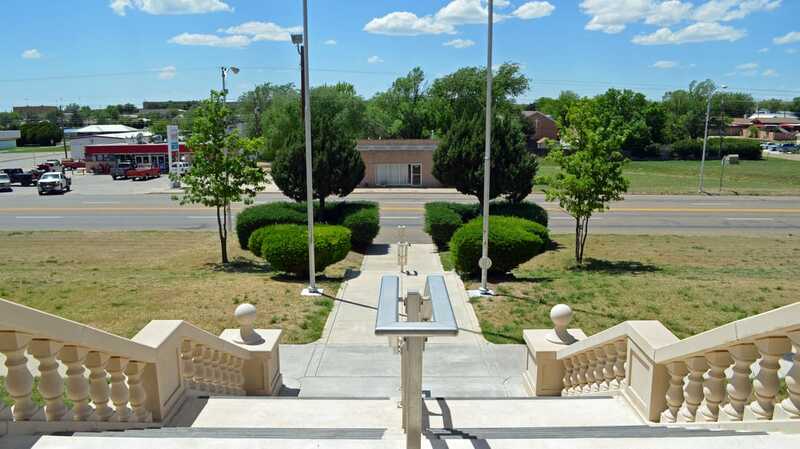 The view from the courthouse entrance. Another view of the west facade. The northwest corner of the courthouse. The northeast corner of the courthouse. 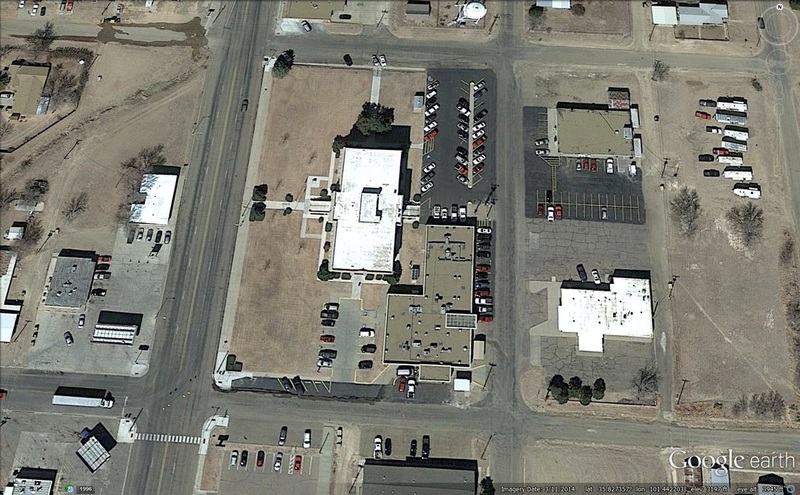 A surface parking lot fills this corner of the block. 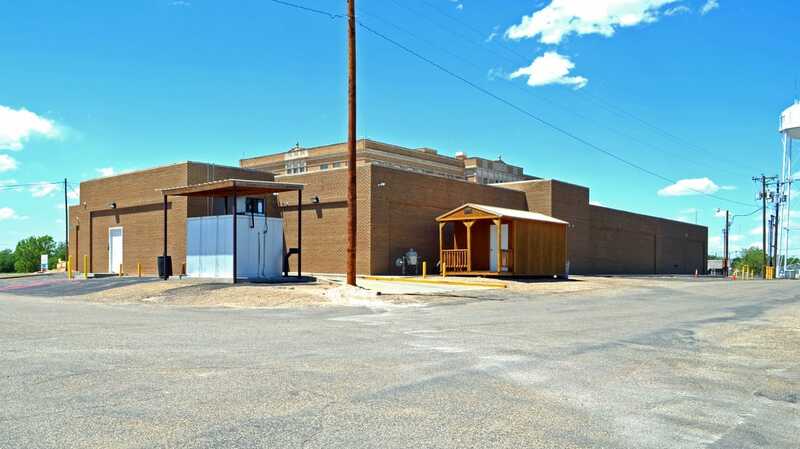 The space between the courthouse and the county jail. 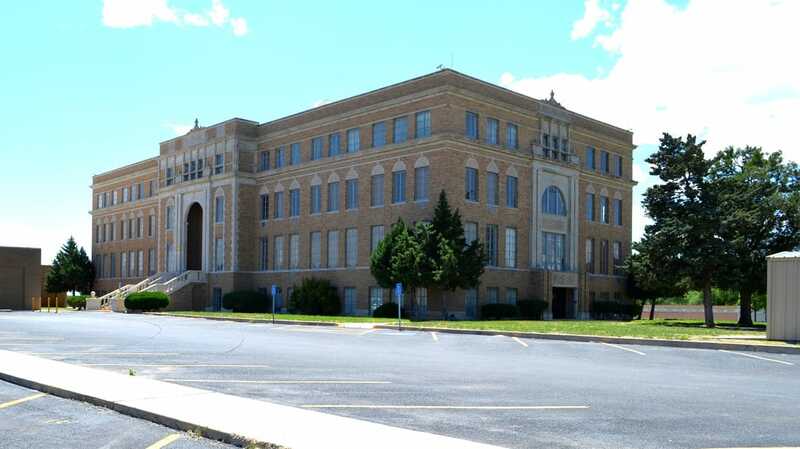 The east facade of the courthouse faces Morse Avenue. The county jail is on the left. The county jail occupies the southeast corner of the block, at 6th and Morse. I am intrigued by the small building with the porch. 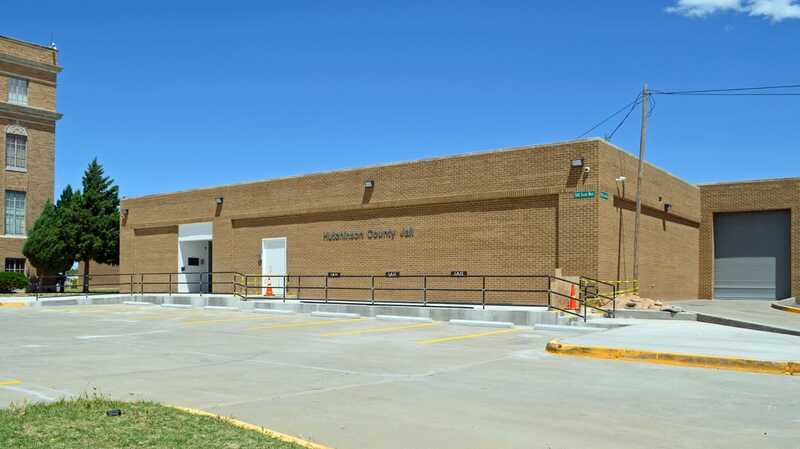 The front of the Hutchinson County Jail. 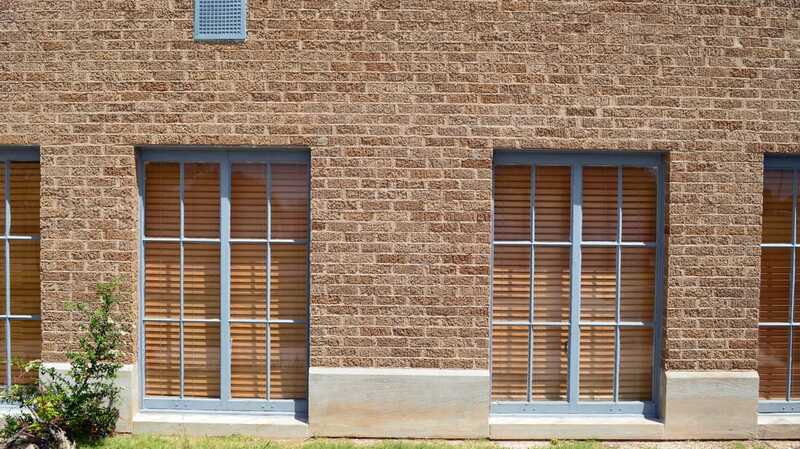 Windows were evidently not part of the program for this building. 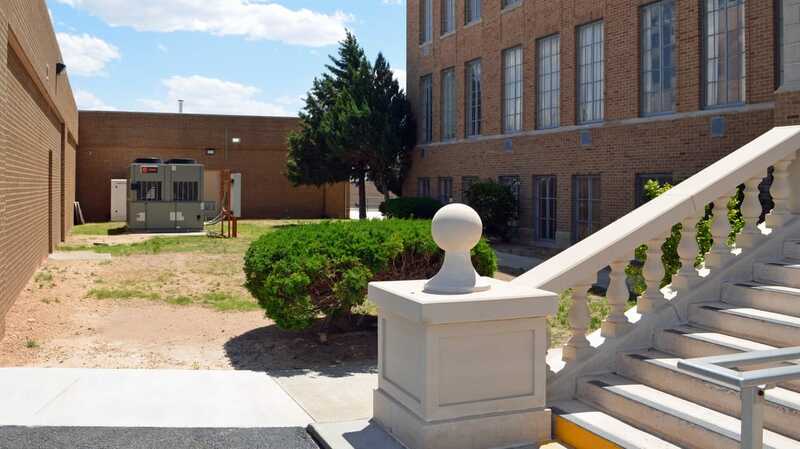 The south facade of the courthouse shares a small parking lot with the jail. I suspect this is the point of arrival for visitors for both buildings. The southeast corner of the courthouse. The base of the courthouse walls. The semi-recessed basement level has windows at grade. The courthouse turkey? Photographed on the north side of the courthouse. It didn't seem to be bothered by my presence. 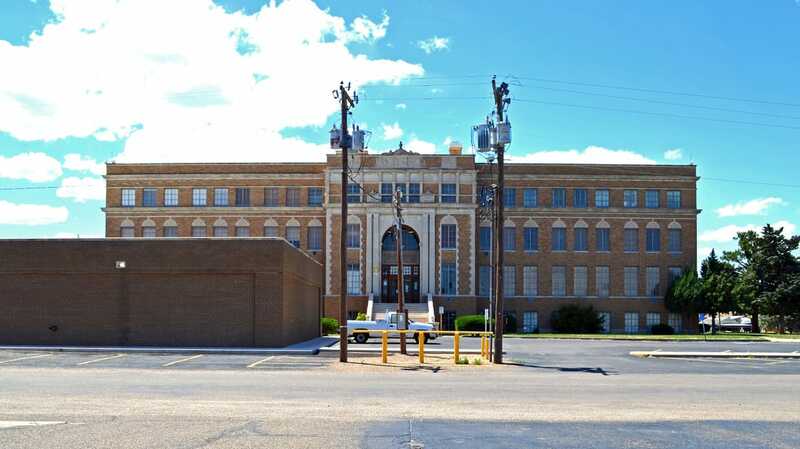 Other than the courthouse and jail, there's not a lot to Stinnett. The Canadian River valley, viewed from the south.